Fly Fishing guided trips and instruction with Hart's Guide Service on the Upper Sacramento River, McCloud River, and Pit River, beautiful northern California waters in Mt. Shasta, Siskiyou County and beyond. The Upper Sac. Begins at the base of Box Canyon Dam on Lake Siskiyou (near the city of Mt. Shasta, CA). Its crystal clear water flows south for 40 miles through a beautiful mountain landscape, the towns of Dunsmuir and Castella and feeds Shasta Lake near Lakehead. Cold springs entering from the canyon walls, stream bed and tributary streams from side canyons, keep the water temperature good for trout all summer. Union Pacific Railroad's tracks border much of the river with Interstate 5 and its many offramps offering great access to most of its riffles, runs, pockets, and pools. Once rearing steelhead, salmon and the Shasta Rainbow trout, the Sac. is now hailed as one of the most prolific wild trout streams in the west, boasting estimated populations from 3000 to 7000 trout per mile. Diversity abounds on this freestone stream, with situations to fulfill every type of angler. From shortline and highstick nymphing the pocket water, to casting tiny dries to selective sippers in the glassy tailouts of long pools, it's all right here. Occasionally brown or rainbow trout to over 5 pounds migrating up from Shasta Lake are taken, although Shasta Rainbows from 6 to 20 inches are the staple. Of our three rivers, easy access, wading and diversity make the Upper Sac. our instructional stream of choice. The McCloud is a river of unparalleled scenic beauty, which begins about 20 miles East of McCloud and flows toward town for 15 miles, where it plunges over 3 spectacular waterfalls into a steep volcanic ravine. Two miles down from Lower Falls, Big Springs quadruples its flow with 44 degree crystal clear water, which rushes through 8 miles of private land, to be joined by Mud Creek (tinted by volcanic ash from Mt. Shasta) at the head end of McCloud Lake. This is where PG&E diverts water to the Pit and the Lower McCloud begins running south at a regulated flow, through 30 miles of rugged river canyon, to Lake Shasta. The Lower McCloud's glacially tinted, emerald pools, slots and pocket water, are as challenging as they are beautiful. The trout population consists of a strain of native Shasta Rainbows, so prized that just after the turn of the century they were stocked worldwide, and wild browns that migrate up from Lake Shasta and average almost 4 pounds, some reaching more than 10 pounds. The first 4 miles below the dam are open to the public, and are managed with special regulations for wild trout. The next 2 miles are the Nature Conservancy's preserve, open to the public and limited to 10 anglers at a time, with barbless catch and release regs. The remainder of the river is private and closed to public access. The fact that no better opportunity to catch trophy sized brown trout exists in any western stream, makes the McCloud our choice for trophy seekers. The scenery makes it a good choice for those wishing to experience a challenge in the most beautiful setting we know of. The Pit originates from the Warner Mountains in the northeast corner of California, near Alturas, and drains the largest expanse of territory of any Sacramento River Tributary. It flows generally southwest through high desert, then drops into steep canyons below Lake Britton, near Burney. Fall River, Hat Creek and the McCloud River are among the many streams that contribute to the large volume of water that feeds PG&E's elaborate Pit River hydro electric project of diversion dams and generators, leading to Shasta Lake. The Pit got its name from the Native Americans who dug pit traps to capture game and intruders, but it's been said that the name best describes the river's terrain. It is very steep and rough in the reaches known as Pit 3, 4, and 5 below Lake Britton, where wading and hiking are difficult. 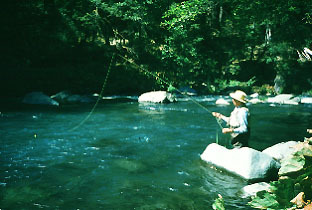 It is perhaps due to these difficulties that the river holds large numbers of heavy rainbows that can exceed 20 inches. Even though flows are regulated by dams and diversions, conditions can vary greatly on this river, spring runoff, rain and summer heat being some of the factors. When the conditions are right, the fishing can be unbelievable, with the average girthy rainbow sometimes measuring over 15 inches long. Knowing this river's trails and accesses well helps take much of the difficulty out of it, making it a good choice for some of our more aggressive guests.